STUNNING VIEW of Coal Harbour, Stanley Park, North Shore Mountains and English B ay. Luxurious urban living at its best. YOu can stroll on the seawall, bike in S tanley Park or go for shopping on Robson Street - you have it all withinwalking distance. Or you can have a romantic dinner on your own balcony overlooking the ocean and mountains. This place suites every lifestyle. If you have height probia, this place is not for you! On 29th floor of one of the tallest buildings in Coa l Harbour, you are higher than many penthouses in the area. A very rarely available opportunity. 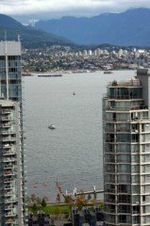 Beautiful one bedroom and storage/den apartment at The VEnus, with panoramic view of Stanley Park, Coal Harbour, and English Bay.